Custom front panels are available on request even for small series, External trigger I/O be it SMA, LEMO connectors or custom specific connectors. All instruments can be triggered using an external TTL signal. It’s possible to use positive or negative edge also in combination with Ethernet Connectivity a programmable pulse width. An internally recognised trigger The GBit Ethernet connection can be event can - when activated by software - be routed to the trigger used with standard COTS Ethernet connector to start external instruments. cabling. The integration into a stan- dard LAN allows to connect the Pulse width digitizerNETBOX/generatorNET- Defines the minimum or maximum width that a trigger pulse must BOX either directly to a desktop PC have to generate a trigger event. Pulse width can be combined with or Laptop or it is possible to place channel trigger, pattern trigger and external trigger. the instrument somewhere in the company LAN and access it from any desktop over the LAN. Multiple Recording The Multiple Recording DC Power Supply Option mode allows the recording of The digitizerNETBOX/generatorNET- several trigger events with an BOX can be equipped with an internal extremely short re-arming DC power supply which replaces the time. The hardware doesn’t standard AC power supply. Two dif- need to be restarted in be- ferent power supply options are avail- tween. The on-board memory is divided in several segments of the able that range from 9V to 36V. same size. Each of them is filled with data if a trigger event occurs. Contact the sales team if other DC lev- Pre- and posttrigger of the segments can be programmed. The num- els are required. ber of acquired segments is only limited by the used memory and is unlimited when using FIFO mode. 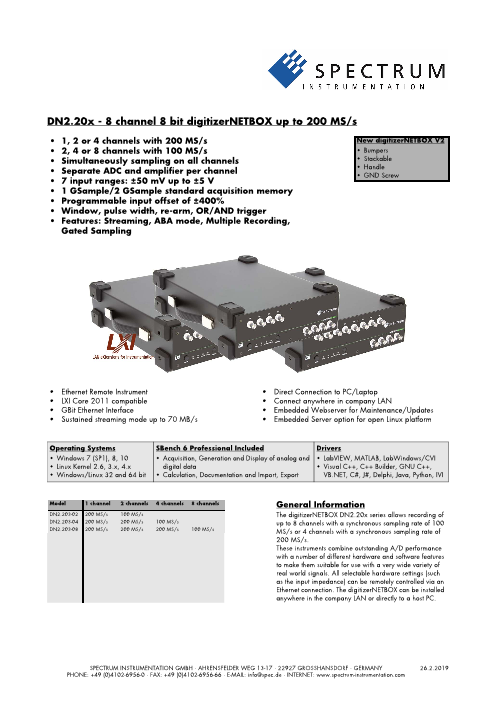 Using the DC power supply the digitiz- erNETBOX/generatorNETBOX can be used for mobile applications Gated Sampling together with a Laptop in automotive or airborne applications. The Gated Sampling mode allows data recording con- Input Amplifier trolled by an external gate The analog inputs can be adapt- signal. Data is only record- ed to real world signals using a ed if the gate signal has a wide variety of settings that are programmed level. In addi- individual for each channel. By tion a pre-area before start using software commands the in- of the gate signal as well as a post area after end of the gate signal put termination can be changed can be acquired. The number of gate segments is only limited by between 50 Ohm and 1 MOhm, one can select a matching input the used memory and is unlimited when using FIFO mode. range and the signal offset can be compensated for. Timestamp Ring buffer mode The timestamp function The ring buffer mode is the writes the time positions of standard mode of all oscillo- the trigger events in an extra scope instruments. Digitized memory. The timestamps are data is continuously written relative to the start of record- into a ring memory until a ing, a defined zero time, ex- trigger event is detected. After the trigger, post-trigger samples are ternally synchronized to a radio clock, an IRIG-B a GPS receiver. recorded and pre-trigger samples can also be stored. The number Using the external synchronization gives a precise time relation for of pre-trigger samples available simply equals the total ring mem- acquisitions of systems on different locations. ory size minus the number of post trigger samples. External clock I/O FIFO mode Using a dedicated connector a sampling clock can be fed in from The FIFO mode is designed for continuous data transfer between re- an external system. It’s also possible to output the internally used mote instrument and PC memory or hard disk. The control of the sampling clock to synchronise external equipment to this clock. data stream is done automatically by the driver on interrupt request. The complete installed on-board memory is used for buffer data, ABA mode making the continuous streaming extremely reliable. 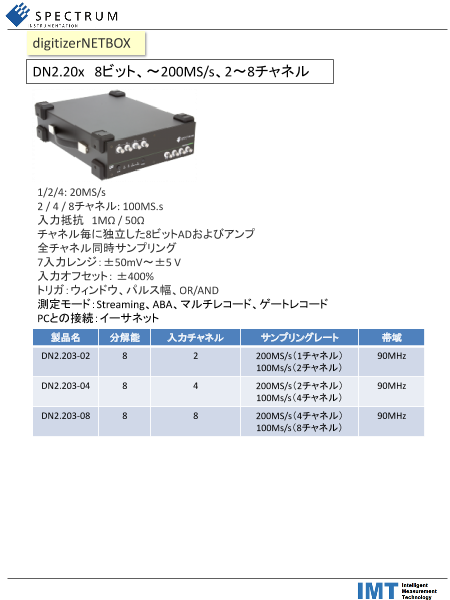 The ABA mode com- bines slow continuous Channel trigger data recording with fast The data acquisition instruments offer a wide variety of trigger acquisition on trigger modes. Besides the standard signal checking for level and edge as events. The ABA mode known from oscilloscopes it’s also possible to define a window trig- works like a slow data ger. All trigger modes can be combined with the pulsewidth trigger. logger combined with a This makes it possible to trigger on signal errors like too long or too fast digitizer. The exact short pulses. In addition to this a re-arming mode (for accurate trig- position of the trigger events is stored as timestamps in an extra ger recognition on noisy signals) the AND/OR conjunction of dif- memory. ferent trigger events is possible. As a unique feature it is possible to use deactivated channels as trigger sources. Reference clock The option to use a precise external reference clock (typically 10 MHz) is necessary to synchronize the instrument for high-quality measurements with external equipment (like a signal source). It’s also possible to enhance the stability of the sampling clock in this way. The driver automatically generates the requested sampling clock from the fed in reference clock. Option Embedded Server The option turns the digitizerNETBOX/generatorNETBOX in a powerful PC that allows to run own pro- grams on a small and remote data acquisition system. The digitizerNETBOX/generatorNETBOX is en- hanced by more memory, a powerful CPU, a freely accessable internal SSD and a remote software development access method. The digitizerNETBOX/generatorNETBOX can either run connected to LAN or it can run totally indepen- dent, storing data to the internal SSD. The original digitizerNETBOX/generatorNETBOX remote instru- ment functionality is still 100% available. Running the embedded server option it is possible to pre-calculate results based on the acquired data, store acquisitions locally and to transfer just the required data or results parts in a client-server based software structure. A different example for the digitizerNETBOX/generatorNETBOX embedded server is surveillance/logger application which can run totally independent for days and send notification emails only over LAN or offloads stored data as soon as it’s connected again. Access to the embedded server is done through a standard text based Linux shell based on the ssh secure shell. Dynamic Parameters M2i.2020 M2i.2021 M2i.2030 M2i.2031 DN2.203-02 DN2.203-04 DN2.203-08 min internal clock 1kS/s 1kS/s 1kS/s 1kS/s max internal clock 50 MS/s 50 MS/s 200 MS/s 200 MS/s min external clock 1 MS/s 1 MS/s 1 MS/s 1 MS/s max external clock 50 MS/s 50 MS/s 100 MS/s 100 MS/s -3 dB bandwidth ±50 mV DC to 25 MHz DC to 25 MHz DC to 60 MHz DC to 60 MHz -3 dB bandwidth ±100 mV DC to 25 MHz DC to 25 MHz DC to 80 MHz DC to 80 MHz -3 dB bandwidth ≥ ±200 mV DC to 25 MHz DC to 25 MHz DC to 90 MHz DC to 90 MHz Zero noise level (≤ ±100 mV) ≤ 0,6 LSB ≤ 0,9 LSB ≤ 1,5 LSB ≤ 2.0 LSB Zero noise level (> ±100 mV) ≤ 0,6 LSB ≤ 0,7 LSB ≤ 1.3 LSB ≤ 1.5 LSB Test - sampling rate 50 MS/s 50 MS/s 100 MS/s 100 MS/s Test signal frequency 1 MHz 4 MHz 1 MHz 4 MHz 1 MHz 9 MHz 1 MHz 9 MHz SNR (typ) 47.5 dB 47.5 dB 46.8 dB 46.5 dB 45.3 dB 45.0 dB 45.0 dB 44.5 dB THD (typ) -56.0 dB -55.5 dB -56.0 dB -55.5 dB -51.5 dB -49.5 dB -49.5 dB -49.5 dB SFDR (typ), excl. harm. 61.3 dB 61.0 dB 60.3 dB 60.1 dB 59.0 dB 57.0 dB 59.0 dB 57.0 dB ENOB (based on SNR) 7.6 bit 7.6 bit 7.5 bit 7.4 bit 7.2 bit 7.2 bit 7.2 bit 7.2 bit ENOB (based on SINAD) 7.5 bit 7.5 bit 7.4 bit 7.3 bit 7.1 bit 7.0 bit 7.1 bit 7.0 bit Dynamic parameters are measured at ±1 V input range (if no other range is stated) and 50Ω termination with the samplerate specified in the table. Measured parameters are averaged 20 times to get typical values. Test signal is a pure sine wave generated by a signal generator and a matching bandpass filter. Amplitude is >99% of FSR. 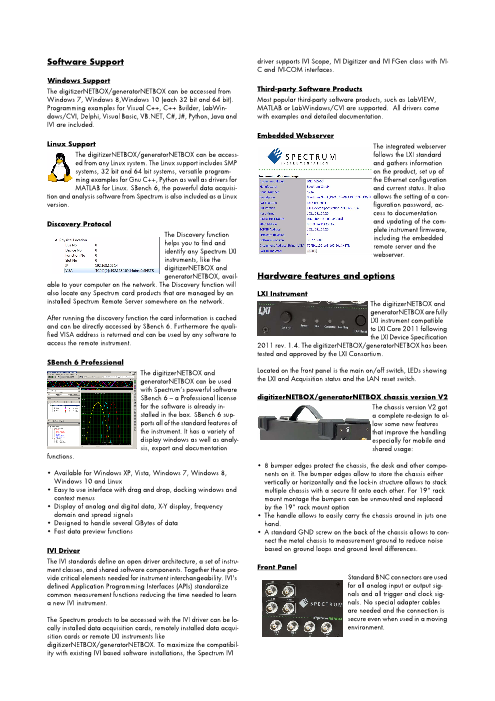 SNR and RMS noise parameters may differ depending on the quality of the used PC. SNR = Signal to Noise Ratio, THD = Total Harmonic Distortion, SFDR = Spurious Free Dynamic Range, SINAD = Signal Noise and Dis- tortion, ENOB = Effective Number of Bits.